The Pantheon has existed for over 2000 years. Despite its great age its dome remains the largest unreinforced concrete dome in the entire world. The building itself was originally designed as a temple to honor all of the ancient Roman gods. However, after the collapse of the Western Roman Empire it was consecrated as a Christian place of worship in 609 AD. Pilgrims can still to this day attend Mass here on weekends and holy days. 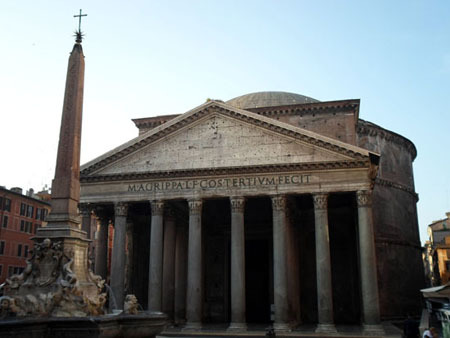 Begin this walking tour at the Pantheon. From here head south to visit Santa Maria sopra Minerva. One can typically leave Santa Maria sopra Minerva through a door located to the left of the main sanctuary in the front of the church. This will exit upon Via di Sant’Ignazio. Head left on this street to visit the church of Sant’Ignazio. From here continue west along Via in Aquiro to visit La Maddalena. Finally, proceed north along Via di Campo Marzio to reach San Lorenzo in Lucina. The following churches are listed according to the order of the suggested route. The total distance is about 1 mile. To walk will probably take about 2.5 hours when one stops at each of the churches. The churches are generally open from 7AM-1PM and from 4PM-7PM. The Pantheon, however, will remain open during the pranzo hour. *To the left of the main altar is Michelangelo’s famous statue of Christ the Redeemer. A bit further left near the Frangipane Chapel is the tomb of Fra Angelico (d. 1455). *The body of St Robert Bellarmine (d. 1621), a prominent cardinal and theologian of the Counter-Reformation, rests under the altar in the third chapel on the right side of the nave.